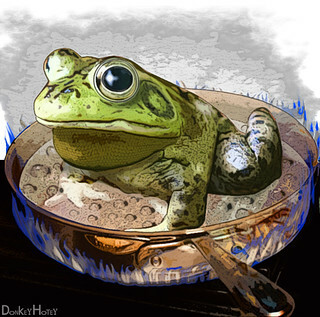 “I’m getting hot,” croaked the frog as he floated in a pot of water from which steam was beginning to rise. As the water simmered, the frogs slipped into a stupor; they were unconscious as they began to boil. As the crises of capitalism deepened in the 20th century, the emphasis on subjectivity increased, especially in the realms of art and philosophy. The inner world, the joys and pains of our private emotions, was portrayed as the highest and most authentic topic for art. The artist became the new priest, guiding us to sublime planes of existence. This prevailing esthetic encouraged us to leave the crass social reality behind and become an aristocrat of the spirit. It reinforced passivity and turned the personal life into a refuge from and a substitute for the public life. This trend has now reached its effete endstage in postmodernism with its deconstruction of reality into conceptual narratives which have only subjective meanings. We are saturated with art and entertainment that tell us to shun the social deterioration surrounding us and focus instead on romance, violence, and the shimmers of our interior zones, while outside the heat is gradually turned up and the conditions of our lives degraded. Our eyes are captivated by images on electronic screens and our minds captivated by hyper-stimulated feelings flooding our mental screen. We are losing the capacity for clear thinking and objective analysis, so effective action is slipping from our grasp. We’re on our way to becoming frog soup. We are in desperate need of an esthetic that will enable us to recognize our calamitous situation, identify the causes of it, and act to change it. Once we can understand how destructive capitalism really is, the necessity of socialism will be obvious. Some works of art do criticize the system, protest it, and urge reforms, but very few challenge it fundamentally. Instead they seek to improve it. But this gradual ameliorative approach has been tried for over a century now and has yielded only superficial changes. Capitalism can’t be fixed from the inside; it is inherently savage and must be replaced. It is time to move beyond criticism, protest, and reform and instead build a mass movement that can eventually overthrow the government and the corporations it serves. This impulse inspired my new novel, Lila, the Revolutionary, a fable for adults about an eight-year-old girl — smart, charming, and tough as can be — who sparks a world revolution for social justice. She not only jumps out of the pot but shows everyone else how to do it. No one ever told her she couldn’t end poverty and inequality, so she doesn’t doubt that she can Just Do It! Starting with the Nike shoe factory where she works. Like the boy in “The Emperor’s New Clothes,” Lila can see the reality that adults are blind to. And she’s not shy about pointing it out. The book is a call to action: If Lila can do it, so can we. Her story convinces us that Yes, a better world is possible, and we’re the ones to create it. The negotiating room in the city hall was high ceilinged with gold chandeliers and big windows. On one wall were pictures of the men who had been mayors of the city, the new ones photos and the old one paintings going back hundreds of years. On the other wall was an aerial photo-mural of the city showing all the skyscrapers but none of the poverty. The worker reps sat on the photo-mural side of the long, polished-wood table and the owner reps on the pictures-of-mayors side. The owners looked like the mayors, men in dark suits. A woman in a white uniform brought glasses of orange juice (too sour, Lila thought) and cookies (not sweet enough). On Lila’s chair was a cushion that helped her not to feel so little. Her feet dangled in the air, but she was used to that. She was wearing the special blouse her mother had made and embroidered for her birthday, and her dark hair was pulled away from her face with a red barrette. “Yes, and you do it very well. I’m sure you’re learning a lot.” He leaned back in his chair and smiled. “Are you the owner of the factory?” she asked. With that, the haggling began. The socialist woman became the main negotiator for the workers, demanding a ten percent raise, time-and-a-half for overtime, full wages when injured, better ventilation and fire safety, and a retirement plan. The shoe factory manager did most of the arguing for the owners, explaining why such demands were economically impossible given the global competitive environment. The lady in the white uniform brought tea and coffee and milk for Lila. “We used to have a cow,” she told the lady. “I could milk it. But these men took it away from us. Now they give me a glass of milk back. And the cookies aren’t very good.” The lady walked quickly away. After two hours the owners had agreed to six percent higher wages. They showed a PowerPoint about how higher labor costs would force them to close the factories here and move to another country. “There are lots of people in the world who would love to work for what you’re getting paid,” the leader stated sternly. “So they own part of the company but they don’t work,” Lila said. “Well, some of them also work in the company,” the leader explained. Lila nodded in sullen consent. After an hour of hammer and tongs, the two sides reached a tentative agreement. Exhausted, they took a break and the lady in white brought drinks and doughnuts. Lila had kept her word and stayed quiet even though there were lots of things she wanted to say. “I think this is as good as we can get,” the socialist told her as people were wandering around the room in a daze of fatigue. “We got eight percent more pay, time-and-a-quarter for overtime, ventilation and fire safety, and one worker rep on each board of directors. Your father will be on the board at the shoe factory and you mother at the sewing factory. They’ll get more money for being on the board, and they can bring up problems of the workers. They’ll have a voice in the company. And you’ll have a better life. “Won what? Do we own the factories?” Lila asked. “We’ve been through this before,” he said, despair creeping into his voice. “I work there too!” he insisted. “We can threaten to go on strike again,” the socialist said. Red faced and trembling, the owners’ rep burst out, “Enough! This is madness. We’re done negotiating. We vote now. If you reject it, you’re cutting your throats. I promise you you’ll never get a deal like this again. We will close these factories and relocate. You think things are bad now, just wait. There won’t be any jobs in this city.” He pointed his finger at the socialist. “And I’ll make sure everyone knows it’s your fault! The socialist and two others raised their hand. The owners’ rep glared and ground his teeth. “How many vote against it?” The other four raised their hand. “So be it,” he said quietly. “You’ll be sorry.” He pointed to the socialist and said, “I’ll never negotiate with you again. You put this little monster up to this. I know you did. You wanted to make a deal impossible, and you voted for it just to cover your tracks. Well, it’s not going to work. We’re going to crush this communist movement once and for all.” Face twitching, one side of his mouth lifted away from his teeth, he packed his pocket calculator and stalked out. Chapters of Lila, the Revolutionary are posted on www.amazon.com/dp/1897455844. William T. Hathaway’s first novel, A World of Hurt, won a Rinehart Foundation Award. A selection of his writing is available at www.peacewriter.org. This entry was posted in All Posts News Politics and-or Videos, Capitalism, Entertainment, Labor, Politics, Socialism and tagged Book or Film Reviews or Excerpts, Cooperatives, Creative Writing, Longreads, William T. Hathaway, WPLongform. Bookmark the permalink. Great article by Mr. Hathaway. Thanks Lo. 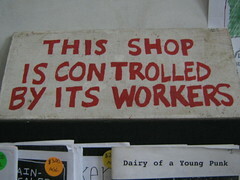 On worker-owned cooperatives, I’ve been to everyone but the San Rafael bakery. Check out http://arizmendibakery.coop/ and click on the links. Thanks, Frank. I fixed the links for you. Cooperatives are the future! I totally agree with you that cooperatives are the future. In fact, the best health food store I was ever in is also an employee-owned cooperative in San Francisco and very successful too! rainbowgrocery.org We patronize them (and the Arizmendi bakeries) when in the SF Bay Area. That is what it is going to take to get away from Capitalism. We need to do what Iceland did refuse to pay any and all debts. Throw out the government and start fresh. We now know what doesn’t work and that is capitalism. Thanks, Elaine for dropping by and commenting. Thanks Tom, I’m guessing you are commenting on the title?